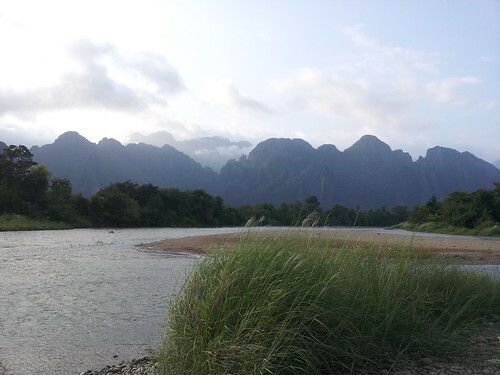 Our journey from Vietiene to Vang Vieng was thankfully very simple and only 4 hours (our shortest yet in South East Asia!) in a comfy air conditioned mini-bus through some stunning scenery, albeit on some very bumpy and winding roads! Strangely the mini-bus dropped as at a guesthouse rather than the bus station where we were launched upon yet again by touts trying to get us to stay there. 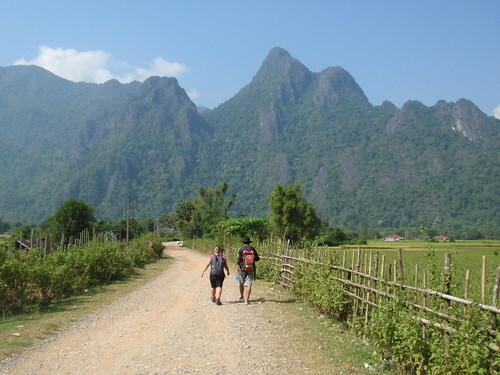 Luckily though the Laos people are so friendly they ended up helping us find our hotel which as Vang Vieng is so small was only a 5 minute walk. 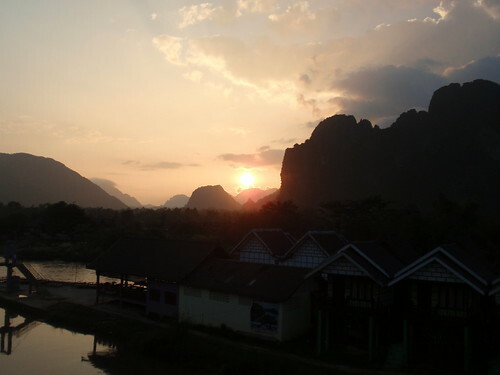 Laos Haven Hotel & Spa (there is no Spa before you ask!) http://www.laoshavenhotel.com was really nice, but could have been stunning. We got the impression that it was quite new, and still needed some finishing touches as our room was quite sparse with mis-matched furniture (and not in a quirky fashionable way!). The staff though were brilliant and it was a great location, easily walkable to the main street, but just far enough away to avoid the noise. Contrary to what we had read in Lonely Planet or the newspaper article Susie sent us, when were said we were coming here. We arrived in a small sleepy town with the most amazing views. 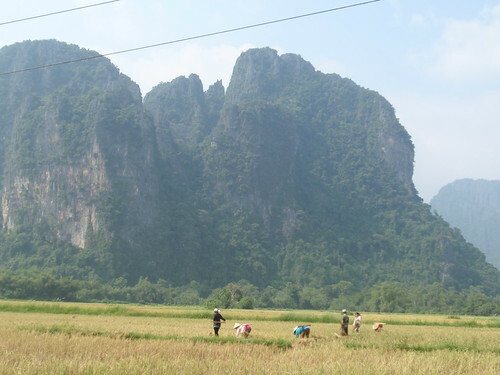 All around us were huge Karst mountains, Jungles, a stunning river and quiet town. The bad reputation was for a party town for backpackers with riverside "beach bars" offering ridiculously cheap drinks and "Happy Food" containing various mind altering ingredients. 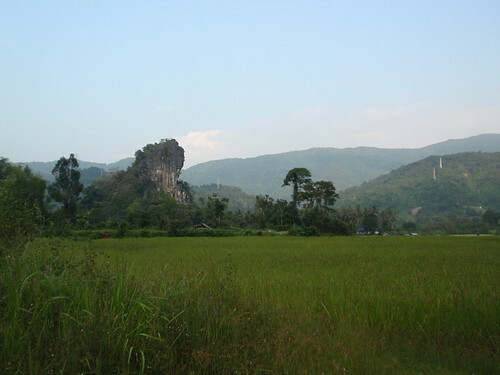 This firstly has the effect of causing rowdy and inappropriate behaviour with scantily clad young adults running around the town offending the very modest Laos people (a T-Shirt is as risky as as you should get in Loas along with shorts covering your knees). Combine this with a large fast flowing river running through the town where you can hire a rubber ring and float down the rapids and jump off rope swings and you have recipe for disaster with a number of backpackers being killed each year, and countless others injuring themselves. Our response to Susie's concerns is best seen in the pictures below!! It was already dusk by the time we ventured out to explore the town and after a quick walk discovered a bar with fantastic views over the mountains and the most amazing sunset! 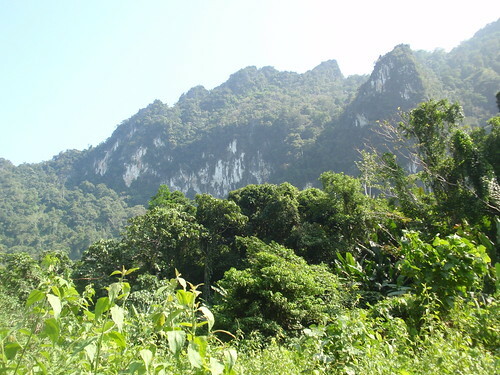 We knew that we wanted to do some Jungle Trekking while we were here and after a lot of looking around (seriously we went in every travel agent!) and our in-decisiveness which has slowly been getting worse throughout this trip was in full force with us finally booking a tour for the next day 10 minutes before the agents closed at 21.00! So after a good nights sleep we were bundled into the back of a large tuk-tuk with some other travellers and set off towards the mountains. After about 20 minutes we pulled over by the side of the road and only the two of us got out to start our trek with our own private guide (everyone else was apparently going kayaking!) - amazing!! 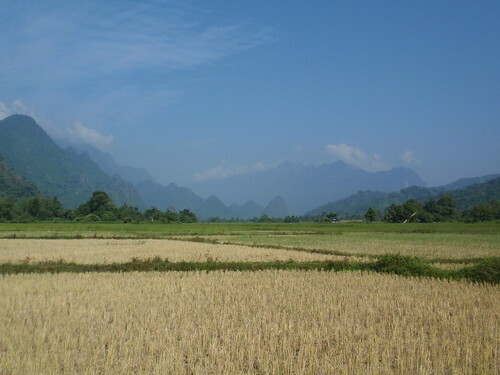 Just walking through the rice paddies and villages on the way to the base of the mountain was stunning. Then we started to climb!! 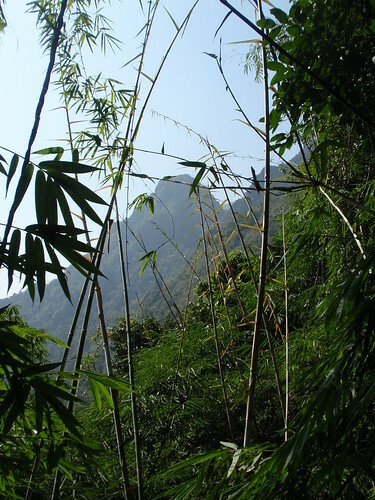 It was steep, seriously steep, slippery, thick with undergrowth that scratched at our legs and so humid we were both dripping in sweat within seconds. It was fantastic! 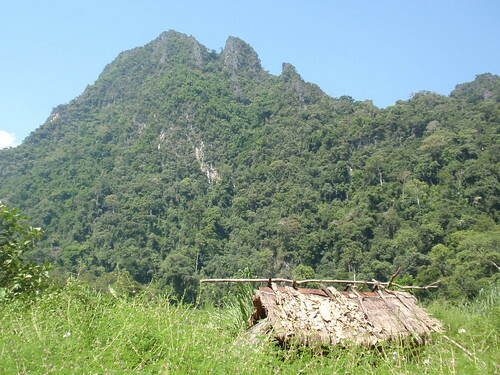 Once at the top we came to a ledge with a amazing views of the jungle, mountains and the valley below which used to be a Hmong Village, now just two small derelict huts remaining. 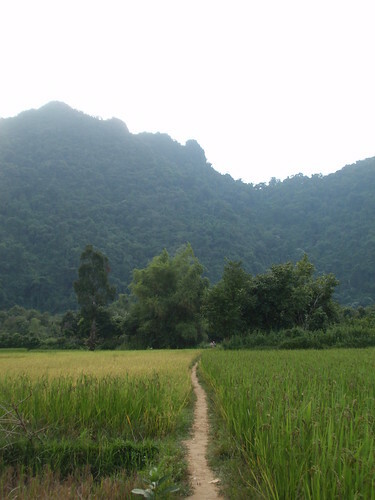 The Hmong would do this climb in reverse everyday to get to school, the market and even hospital! 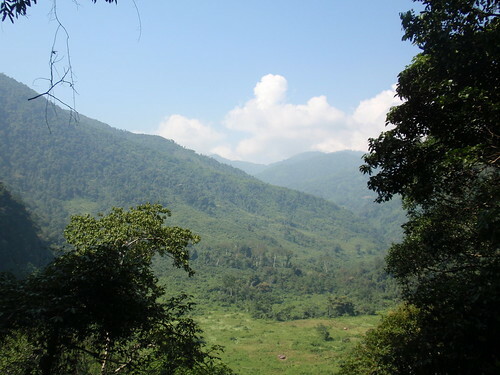 However in the last few years the government persuaded the Hmong to move out of the Village, to the bottom of the mountains closer to town, giving them land and free range as encouragement. I can see how this is for there safety, I would hate to have a broken leg and do this trek! 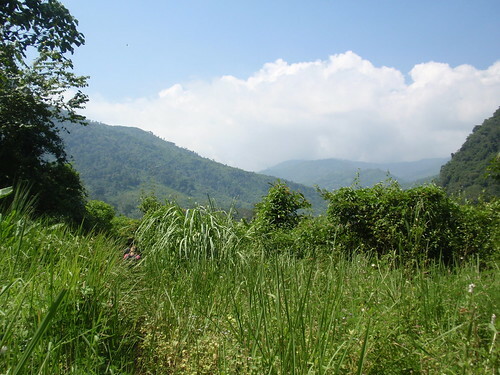 Once safely down the other side of the mountain (over some very slippery rocks with nothing to cling onto but overhanging vines) we had reached the valley and what had looked like a flat plain of grass from above turned out to be a jungle in it's own rite. Pampus grass at least 8 feet in height which had completely overgrown the supposed path we were following. 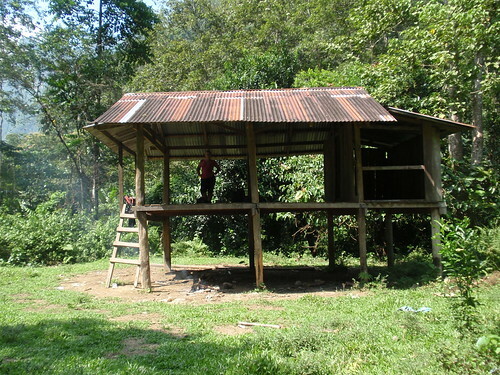 It scratched at our legs and was the perfect home for clouds of mosquitos (luckily we were smothered in replant!). You could not see were you were putting your feet and just had to go for it and trust our guide was doing a good job clearing the ground in front of us! It was at this point our guide asked if we wanted to see the river as there was a cave near by he knew saying "I think the path is this way", pulling out his machete and cutting a new path for us. Nick was not so sure at this point thinking our "tourist friendly jungle trek" may have gone wrong, especially when our guide started pulling leeches of himself, jumping in the air with a scream when he did and cutting them in half with his machete! Again luckily our repellant also works on leeches, and we followed him through thick undergrowth, ducking under branches and squeezing through bamboo. When we finally made it to the river with lots of "come, come, we try, we try" from our guide, he took of his shoes and socks (removing several leeches in the process) and started to wade into the river. 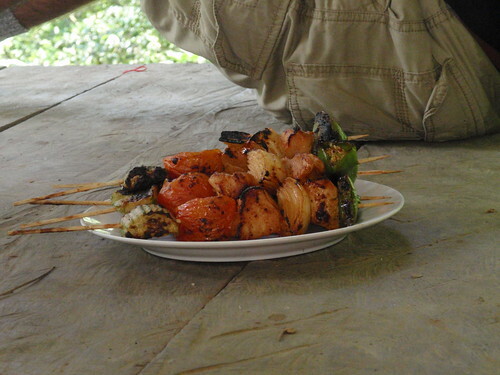 It was at this point we said no (largely due to the leeches) so, following the river bank along (again ducking branches and spiky plants) before reaching a clearing in the middle of the jungle where we had a delicious (although very spicy!) BBQ lunch - I mistook a huge chunk of green chilli for bell pepper NOT GOOD! After lunch we trudged back through the high grass (with more leeches being plucked from our guide!) 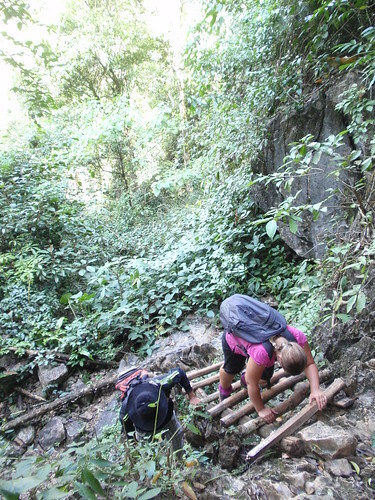 before starting our second steep climb through thick jungle before descending the other side down a very steep and very slippy "path" with both of us taking a couple of tumbles unfortuntely leaving a few bruises!! 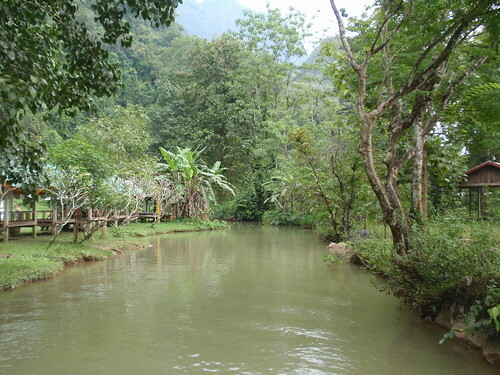 Once we reached the relative flat we soon realised we were not quite were our guide had wanted us to be and it took a short scramble along the edge of the river (more leeches! 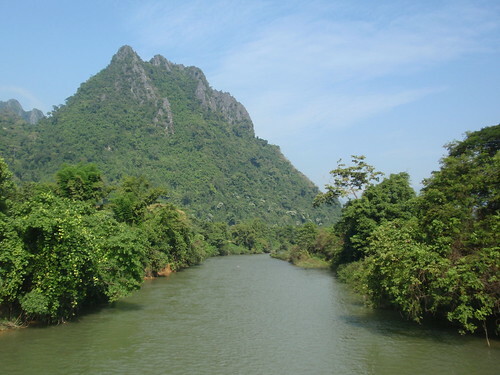 ), a hop over some barb wire and a short walk through the mangroves before we reached our destination - the Water Cave. 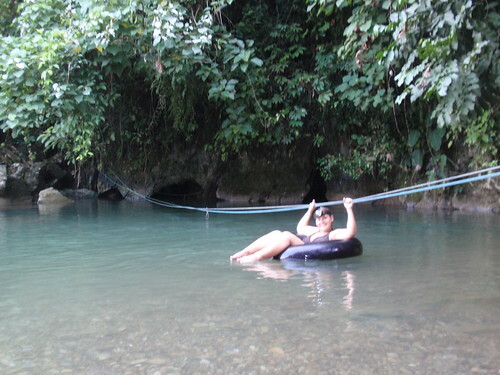 Here we got to do a spot of Cave Tubing where you sit in a rubber ring and use a guide rope to pull yourself through a cave which is flooded with water in the pitch black (they give you a head torch!). Needless to say Nick was not 100% sure about this prospect, but with his new found confidence after the Củ Chi Tunnels in Viet Nam he was not about to say no! 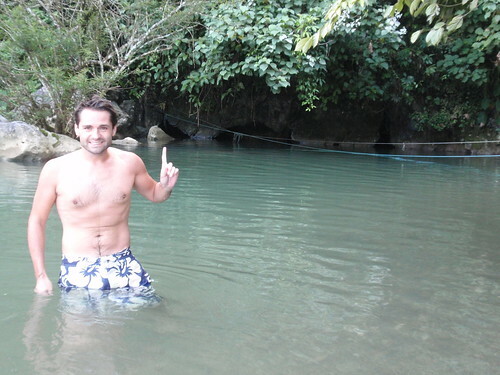 The water was freezing, but it was great fun and a real experience to go that far into a cave floating on top of the water. From here it was a short walk through a farm and a quick boat trip to cross the river before a tuk-tuk picked us up by the side of the road to take us back to our hotel. It had been an incredible day and such an experience!! 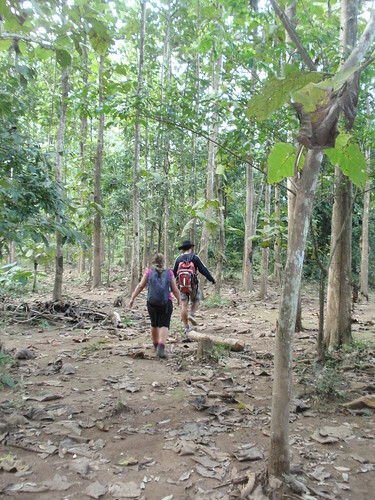 Not many can say they went on a jungle trek with their own private guide cutting their path for them! Needless to say we slept well that night! We woke a little later than intended the next morning, but still managed to make breakfast. 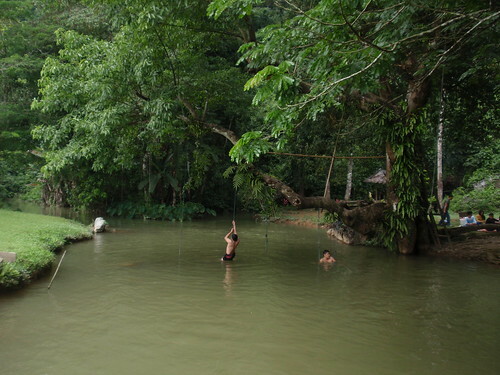 I wanted a lazy day, and Nick had read about The Blue Lagoon; another of Vang Vieng's "must sees" where there was a large cave and clear pool for swimming in, thinking this would be a nice place to relax for the day. 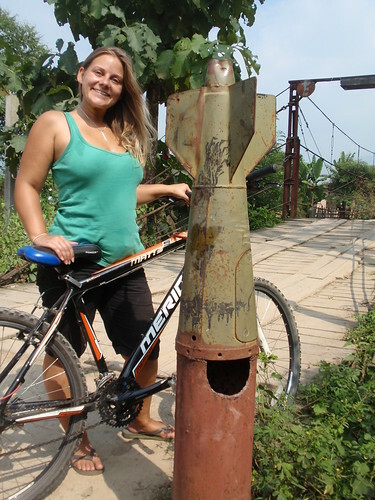 The only problem was that it was about a 7km bike ride outside of town. 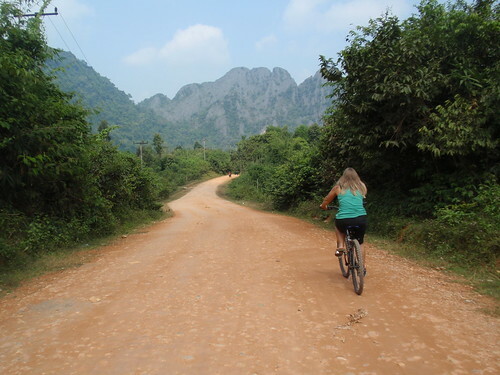 Somehow he convinced me, but after about 5 minutes of riding along the extremely bumpy road having to dodge huge rocks and pot holes, and being shaken so hard it hurt I was not amused! We kept going, stopping for a quick drink along the way to catch out breath until we finally made it - and were both instantly disappointed. Not only was it expensive to get into, you had to climb up some very steep rock stairs to reach the cave (not great after our exploits the day before) and the clear pool, was more of a muddy river - hmmm, we had wasted half the day and still had to cycle all the way back - poo! Once we did make it back, we dumped the bikes and headed for one of the riverside bars where we sat, ate, drank and were generally lazy until long after the sun had set behind the mountains. We left the bar, just as they were cranking up the music and headed back to our hotel to pack for another long bus ride to Luang Prubang the following morning. What an amazing adventure you guys have had, now I can put fotos to the "Air America" book you guys got me, imagine landing on top of those moutains peak landing strips.